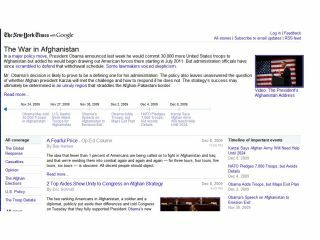 Google is looking into more ways to utilise newspaper content online, and has come up with something called Living News. Essentially a one-stop portal for a story, Living News allows you to click on one URL and read all about an article and the developments and follow-ups that stem from it. Currently it's just the New York Times and The Washington Post who have signed up to trial the service (which is currently in Labs) but the results are actually pretty good. "The idea behind Living Stories is to experiment with a different format for presenting news coverage online," says Google in its blog post. "News organisations produce a wealth of information that we all value; access to this information should be as great as the online medium allows." The interface for Living News is basic to say the least, but what you do get is a bit of a timeline, the main article and the follows-up underneath it. The papers allowing access to content are US-based, as are the stories, but the idea shows just how newspapers could utilise this service and work with Google and not against the search giant – we're looking at you Mr Murdoch.